October 1st: we will be having a Creative Arts Sunday session on October 1st if you are interested in attending please rsvp. Hours will be available between 12 - 4 - the focus will be art, music, creative movement and social skills! The cost of the classes are $65/hour. Please do not hesitate to reach out with any questions. If there is enough interest we will set up more Sundays going forward in addition to our Saturday groups! Class culture meets academic, behavioral and sensory needs in an emotionally supportive environment. Come tour our 7300sq.ft facility and have a question and answer with Founder Amanda Friedman. The popular children's television series Sesame Street is looking to remove the stigma attached to the disorder by introducing a new character to coincide with World Autism Day. Watch Al Jazeera's video which features Atlas. The Atlas Foundation for Autism has grown from words uttered through tears and hugs over the years of individuals on the spectrum, their families, and their loved ones who want more than anything to have a place to feel accepted... and valued! Atlas became a non-profit foundation and school to rise to the needs of our community and now... we need your HELP! When school is closed Atlas is open. Signup for camp today! 10 Week Program - Starting Oct 27th - Kicking The Spectrum® is an adaptive martial arts program developed to teach and motivate students with special needs. Established in 2010, this innovative program incorporates fitness and wellness into the fundamentals of martial arts. Next Date: Oct 22nd - Come join the fun at Atlas every-other Saturday for our newest program where we drum up beautiful beats as students of all ages and abilities have a rockin' good time socializing and jamming with friends. The class will be led by the musical phenom and excellent educator, Stephen Flinn. Tips and tools for ways to prep and facilitate peer play dates for your kids. Juan Robles-Gil Aleman is a board certified music therapist and is currently pursuing a Masters degree in Mental Health Counseling at Hunter College. He obtained a double bachelors degree in music therapy and music production as well as a minor in psychology from Berkeley College of Music in Boston, MA. Kicking The Spectrum® is an adaptive martial arts program developed to teach and motivate students with special needs. We are honored to have Co-Founder David Rosenberg instructing Atlas students! 10am to 3pm each day with the option for early dropoff and late pickup. Emily is a NYS licensed occupational therapist with a masters degree from Barry University in Miami Shores, FL. Prior to obtaining her masters degree in occupational therapy, Emily graduated from San Diego State University with a bachelors degree in Kinesiology. What’s happening during Better Speech and Hearing month (From May) at ATLAS? Movement Method Presentation with Rupert Isaacson, author of The Horse Boy. Book signing & meet & greet to follow. Movement Method is a direct collaboration between Horse Boy Foundation & Temple Grandin! Joining in the program at will be singer, Samantha Elisofon, the subject of her mother's soon to be released memoir, My Picture Perfect Family by Marguerite Elisofon. Happy Saturdays is a social group with a focus on building communication and social skills through movement, sport and recreation. Roxanne Chess & Nicole Kolenda are now LSVT trained clinicians. LSVT LOUD® is an effective speech treatment for individuals with Parkinson disease (PD) and other neurological conditions. LSVT LOUD, named for Mrs. Lee Silverman (Lee Silverman Voice Treatment – LSVT) was developed in 1987 and has been scientifically studied for nearly 20 years with funding support from the National Institute for Deafness and other Communication Disorders. 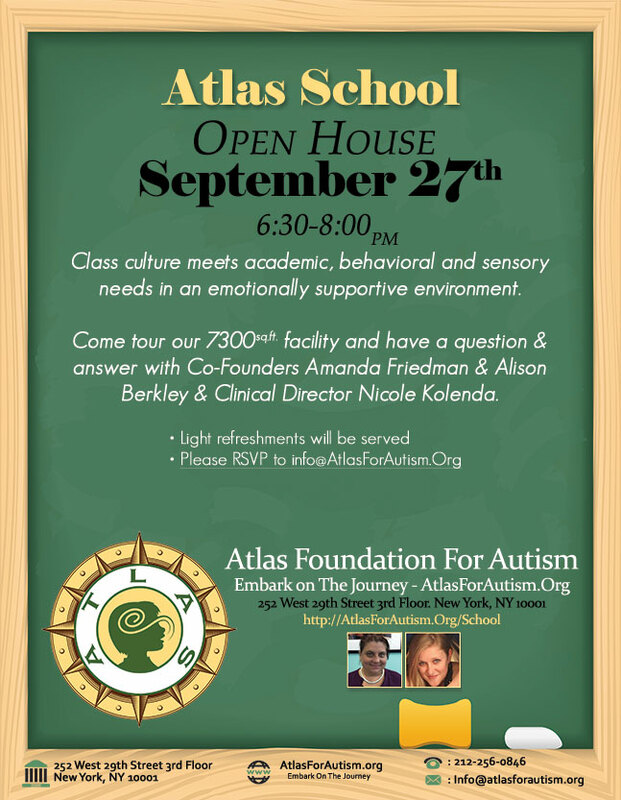 Come to the Atlas School Open House on August 4th - 6&colon;30 - 8&colon;00. Tour our 7300sq.ft facility and have a question & answer with our Atlas Directors. Light refreshments will be served. Come to the Atlas School Open House on June 22nd - 6&colon;30 - 8&colon;30. Tour our 7300sq.ft facility and have a question & answer with the Atlas Co-founders and Clinical Director. Guest speakers will include current families & a special ed attorney. Roxanne is a National Board Certified Occupational Therapist who received her Master’s degree from Boston University. Interestingly to note, she studied Psychology as a minor—which truly affects how she approaches her students—always from a place of compassion and understanding. Atlas Summer Camp 2015’ - Registration Is Open! Atlas' Fun in the sun, summers camp runs 10am to 3pm each day with options for early drop off and late pickup. Click to view our flyer with dates and to register your child for the summer! An evening of sound healing, meditation and a chance to breath for parents, caregivers and educators. The Atlas Foundation for Autism cordially invites you to our benefit on Friday, March 13th 2015! Click to read more and view a full list of raffle items available. The NAA NY Metro Chapter is once again awarding Helping Hand Grants to provide families with financial assistance in getting necessary biomedical treatments, supplements and therapy services for their child with autism. The Atlas Foundation For Autism is honored to be featured in the "Meet The Directors" section of the January 2015 issue of Big Apple Parent Magazine! View our very first newsletter which features interesting articles, top 10 lists, student art work, messages from the directors and the latest Atlas news. Join our mailing list to have the next one sent to you. Ansers: Beliefs about ABA (Lets discuss the pros, cons and controversial ins and outs of ABA and Autism! "How we define behavior, Autism, and appropriateness is a tricky slope to navigate and one bombarded by subjectivity and emotion. The paths of knowledge and beliefs before us often range from exhilarating to avalanche producing. The intensity with which we observe, reflect, and take action has tremendous potential to facilitate great differences in our relationships and ability to understand our children,our students, and ourselves. Oftentimes..."
"Nicole Kolenda, our very own adjunct professor and former clinical supervisor, took a position this summer as the executive clinical director at the Atlas Foundation for Autism. The Atlas Foundation for Autism is a newly formed organization that Nicole's friends and colleagues..."
Autism Speaks Staffer Kerry Magro interviewed Amanda Leeder to discuss her work as a doctoral candidate in Fordham University's Applied Developmental Psychology program. Amanda received her M.A. in general psychology from NYU. She has employed behavioral, developmental and literacy-based approaches to help people of all ages who have more challenging forms of autism. Please call us today and tour our 7300sq ft facility.